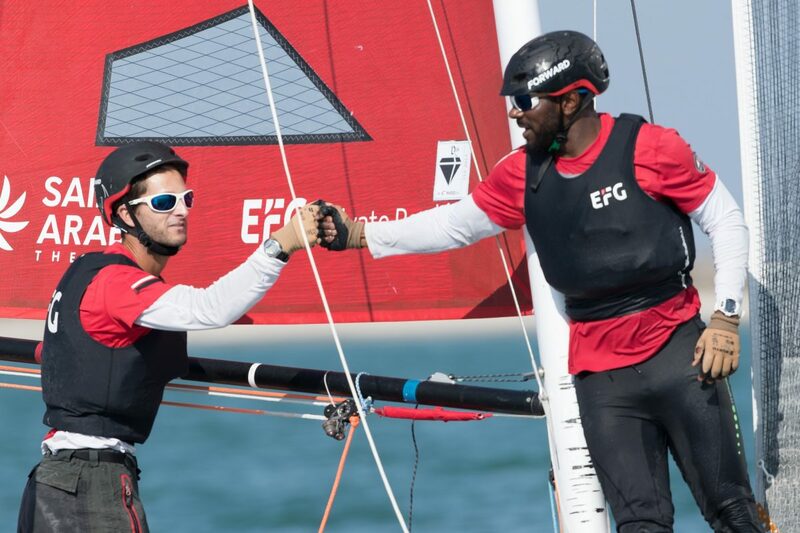 EFG Bank Monaco proved themselves masters of inshore and offshore racing today as EFG Sailing Arabia – The Tour brought its action-packed racing to Masirah Island for the first time. 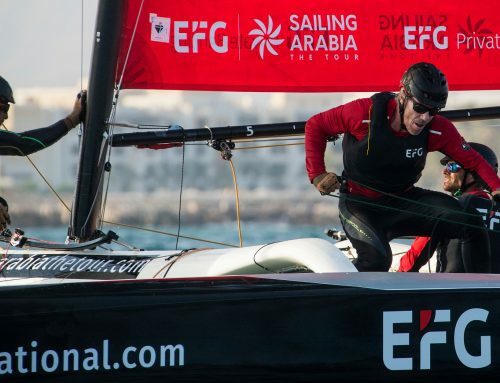 The four-time EFG Sailing Arabia – The Tour winners and current champions dominated the leaderboard in a bumper day of racing that included a coastal raid plus two stadium races. 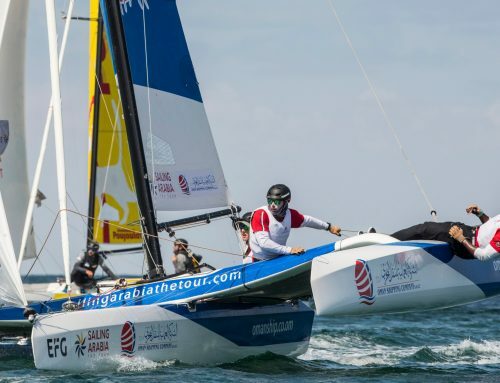 Masirah, Oman’s largest island, is the third venue to host EFG Sailing Arabia – The Tour’s exciting racing following the opening round in Salalah and the second stage in Duqm. 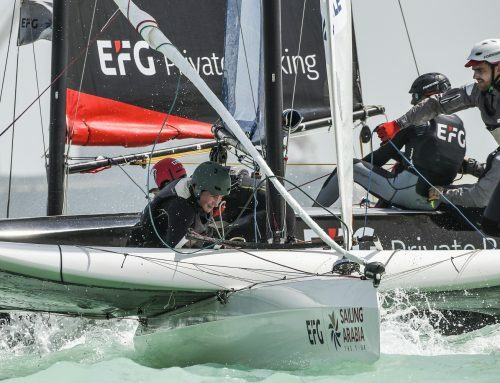 Now in its eighth year, EFG Sailing Arabia – The Tour has had a major revamp for 2018 that has seen a shift to Diam 24 multihull boats and racing take the form of five long coastal races of up to 40 miles and five series of short in-port races. French outfit Beijaflore have been the form team so far in the 14-day regatta but EFG Bank Monaco hit back today with wins in the coastal raid and both stadium races. Led by long-serving Oman Sail racer Thierry Doulliard and including former match racing world champion Mathieu Richard and Omani talent Ali Al Balushi, EFG Bank Monaco have closed the gap on the overall leaderboard to just six points going into tomorrow’s Masirah Stadium Racing series. 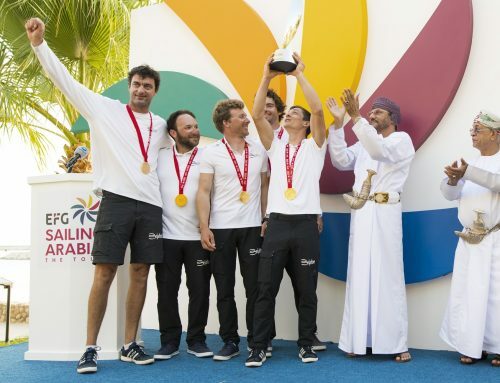 Beijaflore pushed their rivals hard in the 20-mile coastal raid, which took the eight-strong fleet up and down Masirah’s coastline, but had to settle for second. 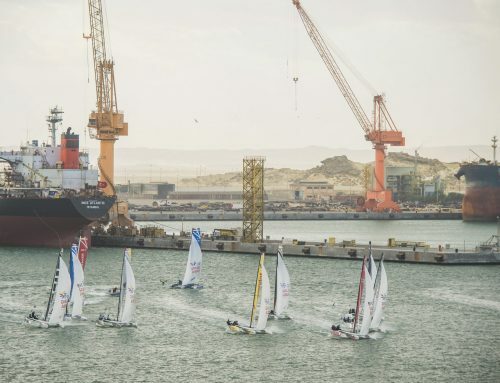 A fourth and a third in the stadium races sees Beijaflore maintain their overall lead – but the momentum is with EFG Bank Monaco with up to five stadium races planned for tomorrow. “It was a very positive day for us,” said Al Balushi, one of the stars of Oman Sail’s programme to reignite Oman’s maritime heritage. “We sailed really well – the communication was good, and we were fast upwind and downwind. British-flagged Averda returned to the dock content with strong day on the water, finishing fourth in the coastal raid before scoring two seconds in the stadium races. It’s an impressive performance from the team, fronted by two-time Olympian Stevie Morrison and including Omani Abdulrahman Al Mashari, given that tactician Nic Asher only has three days of Diam 24 sailing under his belt having joined them in Duqm. “The coastal race was good and bad for us,” said Asher, a former member of the British Sailing Team. “We had a great start but then we got a little greedy, made a mistake and let a few boats pass us. We then did a really good job of catching them back up and overtaking them, only to get a little bit greedy again on the penultimate leg. It was a bit annoying to finish fourth but we felt we were going well. Tomorrow’s action will take place just off Dhuwwah, Masirah’s largest town, from 11am local time (7am GMT).